Discussion in 'Travelogues' started by Vinay Sharma, Nov 2, 2016. Delhi -> Panipat -> Karnal -> Ambala -> Chandigarh -> Shimla -> Fagu -> Narkanda -> Sainjh -> Rampur -> Sarahan -> Karcham -> Sangla -> Chitkul -> Reckong-Peo -> Puh-> Nako -> Tabo -> Kaza -> Lohsar -> Kunzum La -> Baatal -> Chhatru -> Gramphu -> Rohtang La -> Manali -> Kullu -> Sunder Nagar -> Ambala -> Delhi, ~ 1950 kms loop! Would you do this? In how many days? Are you guys prepared? Have you done this before? Questions were put to us by awe- stricken, curious friends and well-wishers when we shared with them our plan to undertake a bike ride to the mountains. But of course we were ready. 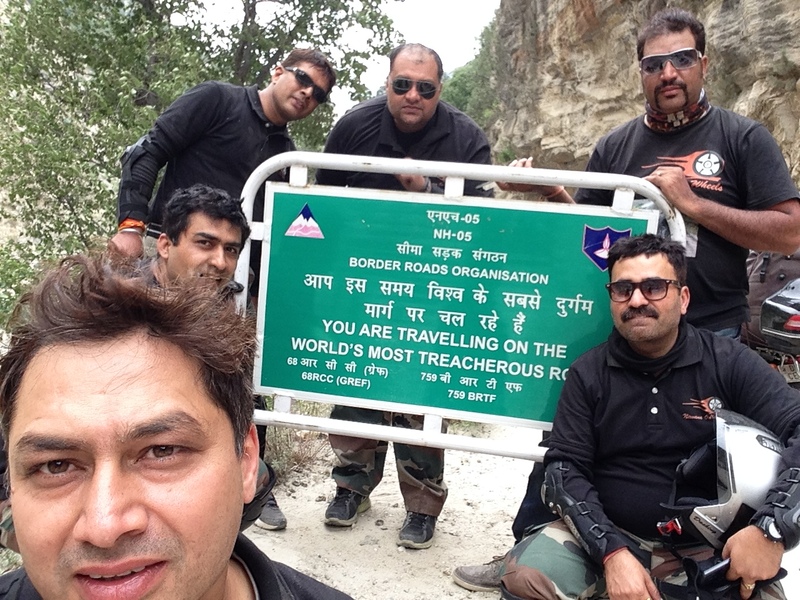 I remember how our old gang met up at my place almost a year back and got talking about this biking expedition. One of our group members is very passionate about biking. During our conversation, he motivated us to embark on such a journey. And that’s how it all began. Before setting off on this excursion, we did small rides over the weekends to prepare ourselves. For our big trip we explored options such as Rajasthan, Leh, Kinnaur-Spiti and Haridwar- Rishikesh, in the interiors of Uttarakhand. 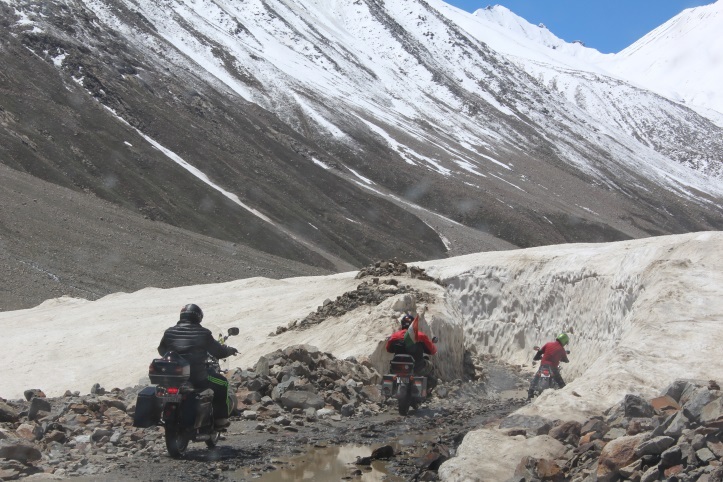 Finally, we chose Kinnaur-Spiti because as compared to routes like Leh Ladhakh, this had more off road tracks. It took us a month to plan the tour which was fixed for June 20-28, 2015.We spent a month in meticulously organizing for the ride, holding stand-up meetings daily at 7 am, and readying a day-by-day agenda.We prepared our majestic machines for the daunting trip and while the night before setting out we were anxious and sleepless, at 4 am our engines were revving and we were ready to go. The riders included Gagan, someone who has thousands of biking kms under his belt; Vinay, the Sutra-Dhār (coordinator) of the trip; Pankaj, the person with the experience of a few hundred biking kms and lots of confidence; Sachin, our John Travolta with a handle bar mustache; Vikas, our lead rider; and Sharat, another born rider. Clad in army fatigue lowers and specially designed T-shirts, we got into first gear at 4:30 am to NH-1 and awesome weather with strong winds greeted us. “Liye sapane nigahon main, chala hoon teri rahon main”, was the song on our lips. 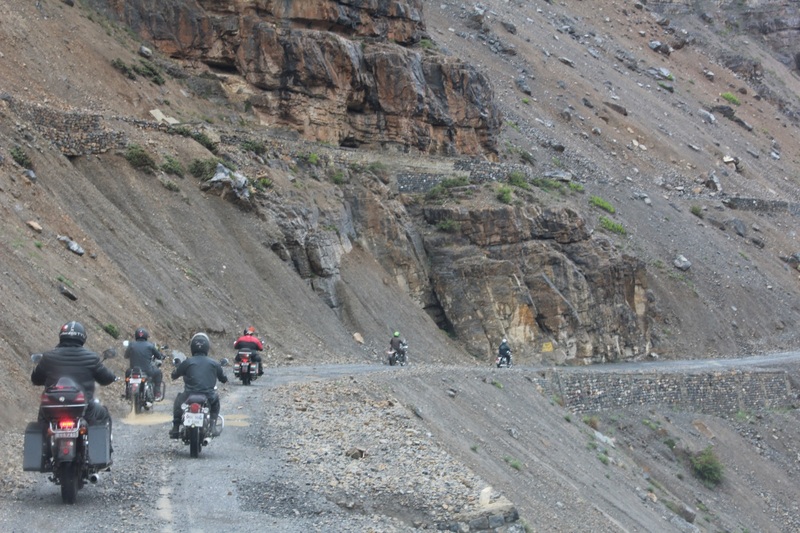 We cruised past sleeping cities and reached the Himalayan expressway. Riding close to 450 kms on Day 1, we stopped for the night in a sweet home-stay nestled in the lap of the Himalayan valley of Fagu. The next pit stop on Day 2 at Sarahan got us closer to the snow clad mountains. We were excited and knew that we would reach them within a couple of days. Pankaj had a scorpion encounter here, a huge one on his slippers. Luckily there was no bite and the predator was murdered there then. A beautiful evening skyline and a serene morning gave us a refreshing break as we knew what was coming up in the day 3. Couple of Triumph riders we met at Fagu told us that there are not going to be any roads further and there is a very bad detour of about 20 kms near Karcham(via Uni). On Day 3 we had our first tryst with off-roading. The road became leaner and meaner. 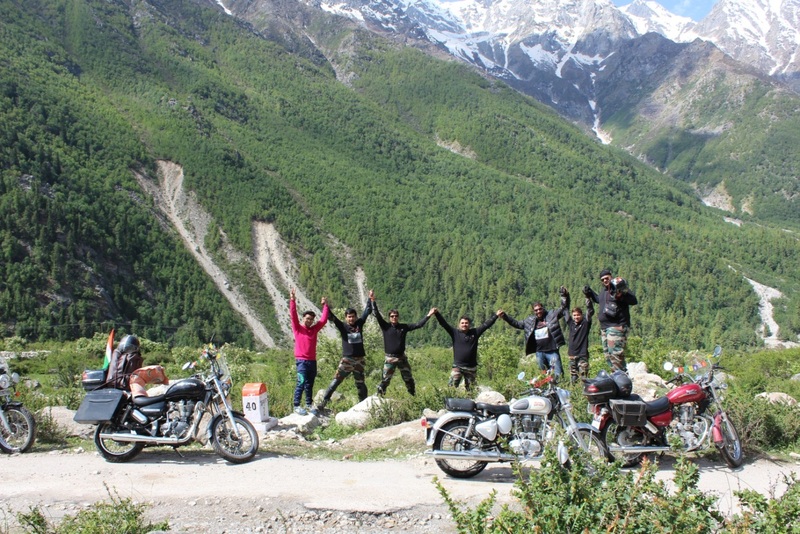 The ride to Chitkul, through the beautiful Sanglavalley, was awesome. The night stay at Chitkul, the last village on the Indo-China border offered us a much needed break. 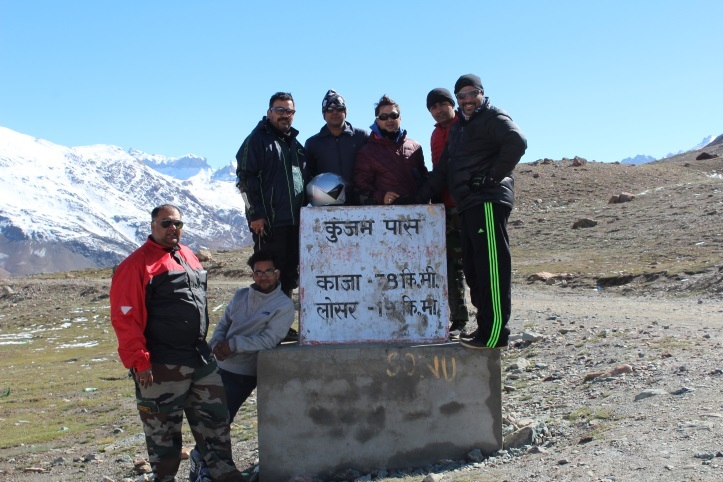 Chitkul– Hindustan’s aakhri dhaba and breath taking views of Baspa valleyrejuvenated us. On Day 4, it was the case of Enter the Dragon’. Yes, we went on the most treacherous road in the world’. It was an exhilarating experience that was marked by anxiety as ‘no roads’ and landslides greeted us as we entered the low habitation, cold desert zone of the Himalayas. For the first time in the trip, we drove through the night. Our thundering bullets and chilling winds created the only sounds in the absolute wilderness. Finally, we reached Nako, a beautiful and quaint place with a nice small lake. 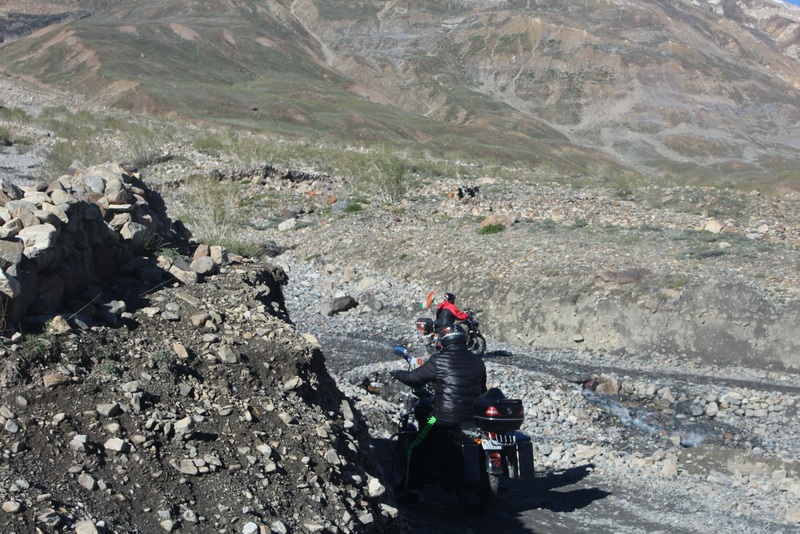 On Day 5, we started for Kaza, our next stop, crossing the beautiful valley of Tabo. The helipad at Tabo played a perfect backdrop for a filmi style photo shoot. On Day 6, we encountered heavy rain and rumors of the route being closed. Our rain suits were out and we started out for our next pit stop. No roads and rain made it hard to ride, and the chill added to the challenge. A humble house in a little habitat served us ‘amrit’ in the form of hot tea and gave us the much needed boost to reach Lohsar. We were now close to 14,000 feet and for the first time experienced altitude sickness. Down and under, we decided to stay in the best accommodation, a dorm that brought us all together. The hot lehsoon tel (garlic oil) massage offered by Vikas to all the fellow riders brought us back to life! Day 7 was the toughest of all. 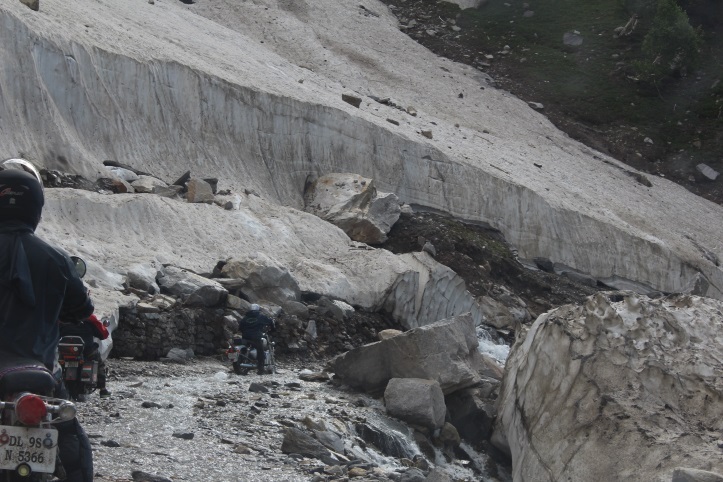 We crossed the highest point in the ride, the Kunzum La pass at more than 15,000 feet with icing on the ‘road’. The nullahs (streams made by water falling on the road) at every bend greeted us like Satan and the big boulders made it impossible for us to ride without a physical and mental push from our most experienced guys. We silently prayed to God that day. “Mushkil Waqt, Commando Saqht” (the tougher the time, the tougher the commando) hollered our leader. “Aye, aye captain” we answered. By evening that day, we were having hot tea at Rohtang La. Day 8 was devoted to the family. We spoke about our tough ride and spent time on buying gifts for the people waiting for us back home. We began our return journey from Manali and spent the night at Sunder Nagar. 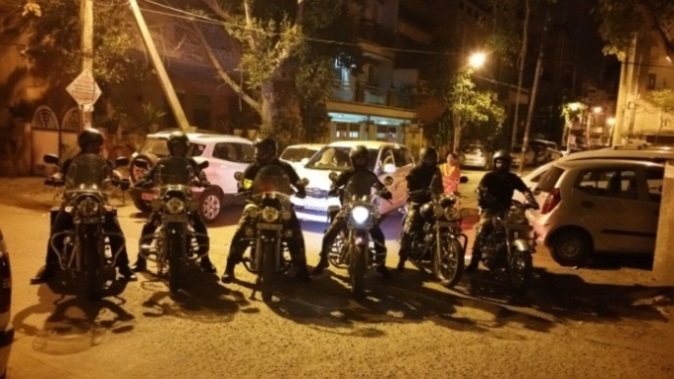 On Day 9 we set out for Delhi from Sunder Nagar. 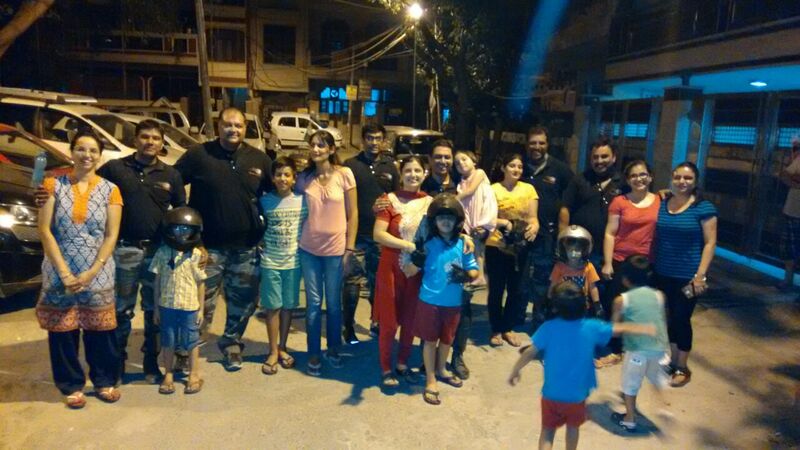 Our families met us as our tour ended, beaming with pride and happiness at our safe return. Mind blowing pics and narration Vinay Bhai ... Did you guys went to Chandrataal as well or was that skipped? We ended up skipping chandratal, road wasn't open and folks were not ready trek 8-10 kms. You are doing a fabulous job in helping people like us. I read through your blogs on the erstwhile domain , vargiskhan.com . 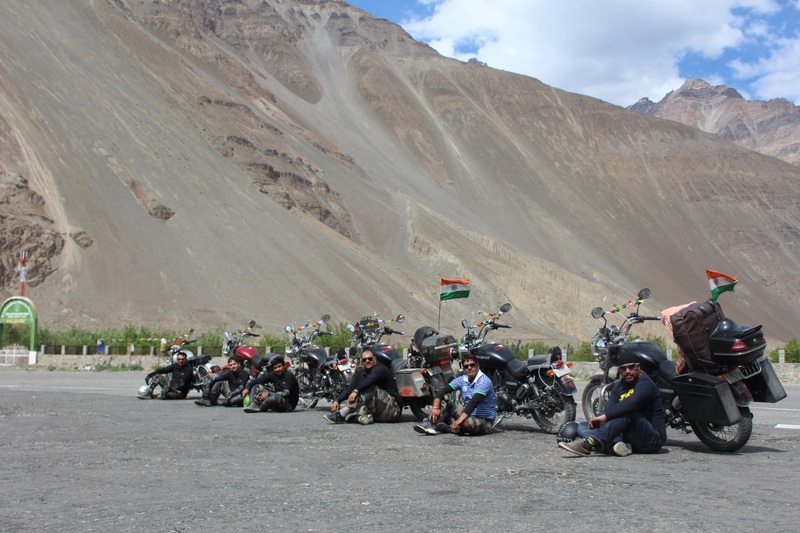 Am planning for Leh next year with same group. Jun mid 2017. we did short excursions post SPITI, shojha-kasol, jamta-renukaji,mussourie, kasauli etc. Very Nice Blog Vinay and amazing pics, the last one with the families really spells pride and joy. Keep the wheels rolling bro!